While welcoming the opening of the Camden Street contraflow bus lane, which was opened to cycling yesterday morning, councillor Claire Byrne (Green Party) repeated her warning about 40 extra buses per hour on the route at rush hour. However Byrne warned about the extra buses at rush hour due to be diverted onto the route next week because of a Luas tram route construction. The Dublin Cycling Campaign yesterday — while also welcoming the contra-flow bus lane — said it had “some concern about mixing so many buses with so many bikes on the corridor”. Some general transport observers are also concerned that the extra buses will mean longer journey times for bus users and the diversions and the Luas works add to congestion. Cllr Claire Byrne (GP) and Dublin Cycling Campaign have rightly drawn attention to the huge numbers of buses plying our streets – cyclists are faced with a wall-of-steel these days. 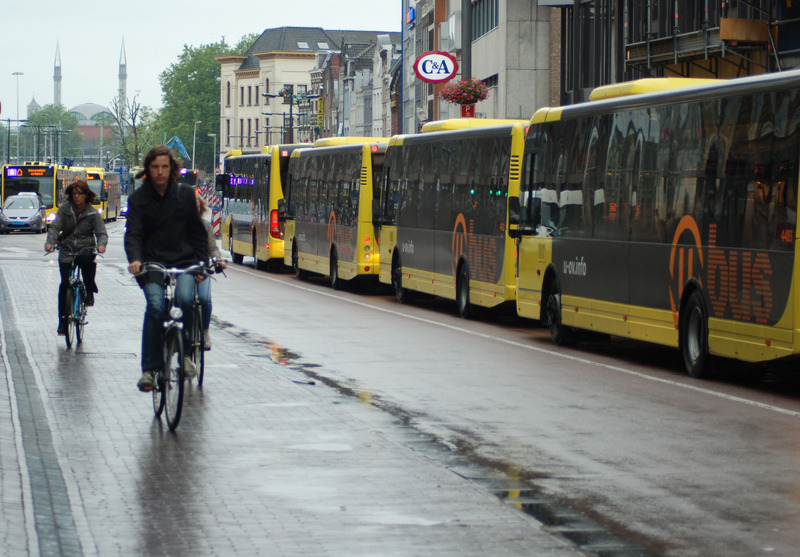 But it is not just buses that form the wall-of-steel it is also the coaches (Bus Eireann, Aircoach, etc) coupled with the huge numbers of taxis that make cycling in bus lanes too threatening for some. One must ask the question: Why are taxis without a fare on-board permitted access to the bus lane system? Taxi drivers do not have to undergo annual CPC training – bus and coach drivers do this training so have some instruction in how to interact safely with cyclists. Why is the Department of Transport and the RSA permitting this anomaly to continue? The city’s air quality is deteriorating due in large part to transport greenhouse gas emissions and with the fact that 74% of new vehicle registrations in 2014 were diesel-fuelled the level of particulates is increasing. Why is Dublin Bus not using LNG to power its fleet? Most of the bus lane network is based on a lane width of a nominal 3 m. It is not safe for a bus or coach driver to safely overtake a cyclist from within lane, particularly when the Wright/Alexander buses have wing mirrors set within the head-strike range of cyclists. It was interesting to observe that between 17:15 and 18:15 h last night at the ‘Bleeding Horse’ sector of the new contraflow there was not one garda on duty.